Colpac’s CafÃ© Collection includes its compostable Freshly Made line of grab-n-go packaging for same day use. 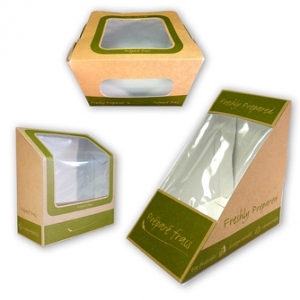 These quality cartonboard disposable food packs with clear ingeo windows complement and enhance fresh bakery, cafe and deli products, including sandwiches snacks, salads, and entrees. They come in a variety of sizes and shapes, and are made from renewable paperboard that comes from FSC-certified forests and plantations. The crystal clear transparent windows maximize food visibility and are made from compostable Ingeo™ — a NatureWorks® biopolymer made from 100% renewable plant-based resources. A family-operated company since 1937 based in Luton, U.K., Colpac began with the manufacture of stitched and rigid boxes, and later printed folding cartons, catering disposables and partyware. Today, Colpac is one of the world’s leading designers and manufacturers of innovative paperboard packaging primarily for the foodservice industry, exporting to over 30 countries. Committed to environmental conservation and preservation, Colpac passed the FSC audit at the end of 2009 and has since been able to offer FSC certified carton board products. The first commercial cardboard packaging was produced in England in 1817 by Sir Malcolm Thornhill. The first cardboard box manufactured in the United States was made in 1895. By 1900, wooden crates and boxes were being replaced by corrugated paper shipping cartons. The advent of flaked cereals increased the use of cardboard boxes. The first to use cardboard boxes as cereal cartons were the Kellogg brothers. Since then one of the main drivers of the foodservice sector has been cardboard packaging, with its demonstrable advantages of printability and origins from renewable sources.